Claim the force of power from Rannveig's Fast. A word for the Kyne's Peace shout. Encounter the regretful ghosts outside Rannveig's Fast. (Optional) Sneak behind the warlock for an ambush attack. Claim the treasure and learn a word for the Kyne's Peace shout. The Nordic ruin called Rannveig's Fast is located in the wilderness south and slightly to the west of Morthal, not far from the shores of River Hjaal. No road will take you there, so either follow the river or take a shortcut through Cold Rock Pass to reach the ruin. The exterior is quite large and guarded by some rather unusual Subjugated Ghosts and a single Ghost Adventurer, all of whom will apologize for attacking you. You can either choose to put them out of their misery or simply enter the ruin, as they will not follow you inside. The door opens to a huge chamber with the sky visible above and the floor overgrown with ferns. Proceed north and you will meet another subjugated ghost, who is unwilling to attack you but forced to by unknown powers. The next huge chamber has another regretful ghost wandering around. There are several paths to choose: the locked southern door leads to a small chamber with a minor loot chest, while the northern door will offer an alternate route to discover the secrets of the ruin. The most tempting option will obviously be the chiming word wall to the east, with a huge glowing chest in front. "This is actually going to hurt a lot." If you walk directly towards the word wall and the glowing chest, the darkened part of the walkway will turn out to be a cleverly hidden trap door and you will fall down to another level through another trap door until you finally land inside a locked cage. Here you find yourself surrounded by the bodies of dead bandits floating in knee-deep water. Outside the cage, Sild the Warlock will be wandering around and will be pleasantly surprised by yet another rat in the trap: "Ooooh...yes...yes. You've fallen for my trap! Greed makes a great lure. Odd you didn't die from the fall though. Most do." Due to your unexpected, but most welcome survival, he will start messing around the chamber, looking for something with which he can dispose of you as quickly as possible, so he can subjugate you as part of his army of ghosts. When he finally locates his desired item he will say: "Ah...Here it is. Now, if you'd be so kind as to stand still this will be much easier for me to do. Oh, and I wasn't entirely truthful before. This is actually going to hurt a lot. You see, you have to be dead in order for the spell to take hold." 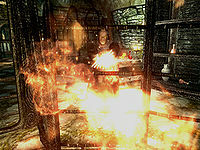 Sild will then proceed to cast Oakflesh on himself and then shower you with flames or firebolts. Without resorting to dragon shouts from inside the cage, there are three ways to get out and fight Sild face-to-face. First, you can examine the dead bandits in the water; one of them has ten lockpicks. Alternatively, search the satchel found just to the left on the cage door. It contains the key to the door. Lastly, when your health is almost down to zero, Sild will open the cage himself to finish you off. "This one didn't survive the fall either." If you manage to resist the temptation of the word wall and the glowing chest, the northern tunnel leads to a closed gate with a handle visible on the other side. Go south from the gate and up two sets of stairs until you reach a handle. The western path leads to the overhead bridges above the huge chamber and a room with another subjugated ghost and some minor loot, including a locked chest and a diamond in the hands of a dead bandit. Backtrack to the handle, pull it, and head downstairs to the iron gate, which will now be raised. Fight another ghost and take the only available path into the depths of the ruin. You will see a wooden door, but that will be your escape route so skip that for now and follow the voice coming from the western chamber, preferably using Sneak to avoid detection. Before long you will see Sild the Warlock wandering restlessly around in his chamber, waiting for yet another victim to fall for his glowing chest-trap, mumbling to himself: "Come on! You know you want what's in that chest. Just walk toward it! ", "Just walk toward the chest! Gravity will do the rest." and "I know you're up there. Go get the treasure. Doesn't it look pretty?" If you wait long enough, an Orc bandit will take the bait and fall down in the chamber, dying immediately. A frustrated Sild will comment: "Well...that's disappointing. This one didn't survive the fall either. No matter. Another one will be along any time now." He will then keep wandering around the cage, hoping for more victims, but nothing else will happen. Note that Sild is hard to sneak up on, so just get as close to him as possible, then fight and kill him. After battling Sild, make sure to claim the key if you haven't picked it up already. Notice the dead body of Sild's assistant near the cage, then examine the chamber for answers. The rows of cages contain more dead bandits, a dead dog, a dead Wood Elf, and a dead Breton. 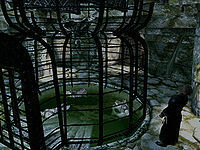 Most importantly, examine the table next to the Alchemy Lab for Sild's Journal to learn the truth of Sild's sadistic activities. Lastly, unlock the boss-leveled chest for your reward, and check the table for an Unusual Gem and the Destruction skill book Horror of Castle Xyr. When all is said and done, head east and, when you reach the wooden door, open it and head south. In the last room, a door leads outside to a small ledge east of the main entrance. Learning the word of Kyne's Peace can be done after or before confronting Sild. The trap door is before the word wall, but you can either walk on the edge of the floor or jump over the trap door making it possible to run past the door without falling down. The quest is never shut down when Sild the Warlock dies. All of the quest stages are empty: 0, 10, 20, 25, 27, 30. 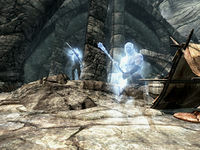 On the PC, it is possible to use the console to advance through the quest by entering setstage dunRannveigQST stage, where stage is the number of the stage you wish to complete. It is not possible to un-complete (i.e. go back) quest stages, but it is possible to clear all stages of the quest using resetquest dunRannveigQST.